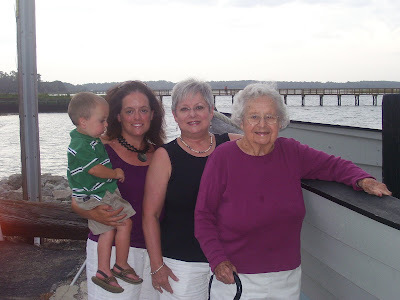 This picture was from the week we spent with Mom, Ivey and Grandma Jo at the beach. What a fabulous memory. Unfortunately I don't have a more recent picture of her from their trip out here 2 weeks ago, but oh well. After spending the weekend with us, Mom and Ivey went back to NC and Ivey became more disoreinted and tired. The beginning of this week Mom took her to her dr. and she requested a chest exam due to some wheezing in her lungs. On Tuesday she had a slight trace of pnuemonia in her left lung, but within 12 hours and some antibiotics, it had filled her whole lung. She was rushed to the hospital, UNC, and has been there ever since. Please pray that her body would continue to respond to the meds, restfulness as it is a struggle to breath, and for the dr. 's discernment. Please pray also for mom, as she is caring for her and spending most of her days with her at the hospital. I am so grateful that we just recently saw her, but I do long to visit her during Thanksgiving. Oh Laurie, I am so sorry to hear this. Did you know this yesterday when I saw you? I will definitely pray for Ivey and your mom. I know it must be hard to be so far away...I'll pray for you to have peace as well.